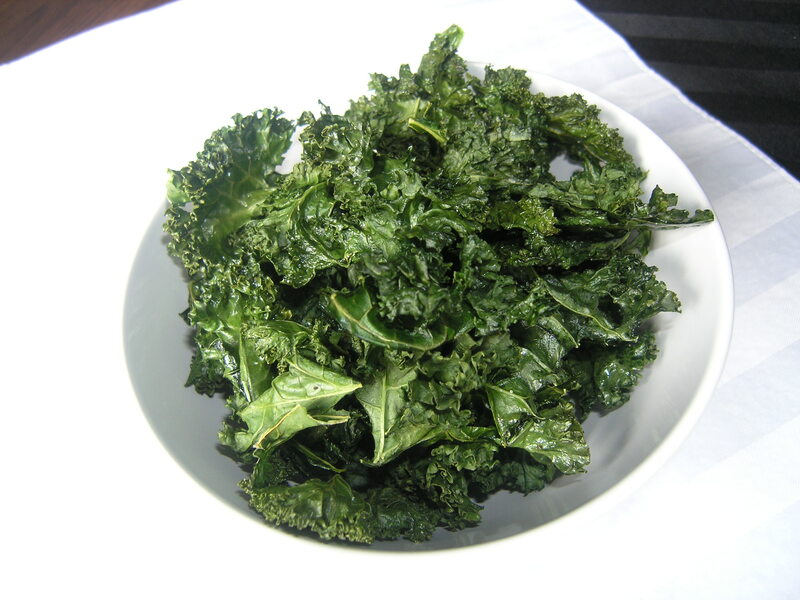 Kale chips are all the rage in the food world right now. While we were living in Arizona, Ryan and I used to find any excuse to go to Whole Foods and get samples… “oh, we need one apple, right?”. Crunchy, flavorful, delicious- we’ve tried every kind from ranch dressing to garlic Parmesan to chocolate infused. We never buy them though because they are pretty expensive! Something like $13.00 for a 16 oz bag- no thank you. For a much cheaper price, I decided to make my own! I was thinking about what kinds of fun flavors I could make. Something new and totally different to set them apart. But as I got more and more creative, I realized I was taking away from the whole point of snacking on something like a kale chip. It’s supposed to be a healthy snack that you can substitute for potato chips without the fat from fried potatoes. So no cheese, fancy dressings, or Italian seasonings here. Just a lightly salted, addictlingly crunchy chip that will switch up your normal snacking routine. Maybe more flavors in the future, but for now I wanted to keep things simple and easy. Rip the leaves into bite sized pieces; err on a little too big versus a little too small. Toss the leaves in the oil by drizzling the oil over top and mixing together with your hands. If you have spray olive oil, I think this actually works better. You don’t want to over-saturate the leaves or they won’t crisp up. Make sure the oil is spread evenly over the leaves and place onto a cookie sheet in one even layer. Season with the sea salt and bake for 20 minutes. Remove from the oven and let sit for a minute before eating. LOL, I’m laughing because I made these last week while your sis was home. I used the purple kale (BEAUTIFUL) and even threw in the bagged kale mixed with carrots. Really easy and healthy as you can get! Just tried these, and they are great! My daughters and I are on our second batch tonight.